Although the exploits of the Vikings in Iceland, Greenland, and even the New World were well known across Europe their involvement there ended about . In what year did the Goths destroy the second temple? The fallen Colossus was left standing until what year? How do you alter the color? You will find this common source of job information in the classified section of the newspaper. Tints are light values of a color. Tints are created by . When representing himself in court, a defendant said "I have told the truth, and I have always heard that the truth would set me free." What type of logical fallacy is being used? What comes before you put the pillow shams in place? Adding the bedspread or comforter. Angle B is a right angle. Label the point where the altitude intersects the hypotenuse D. Given that side AB = 8 and hypotenuse AC = 22. Find the length of segment AD. Show your work and round to the nearest tenth. 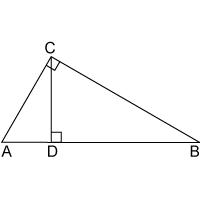 Angle C is a right angle. Given that side AC = 15 and hypotenuse AB = 30, find the length of segment AD. Show your work and round to the nearest tenth. A solid can be changed to a liquid by adding what? What year did Constantinople fall?